The US Golf Courses App gives you quick and easy access to information for over 13,500 golf courses in the United States. Each listing comes with detailed information about course conditions and contact information. You can get driving directions or call the clubhouse with the push of a button. The US Golf Courses app will automatically figure out your location and give you a list of nearby golf courses. With a few taps of your finger you can be on your way to playing a round of golf at your favorite neighborhood course. The app is also perfect for travelers looking to get in a round or two at a new golf course while on vacation or a business trip. You can browse our database of US golf courses by state and city. Drill down to find golf courses in any of the 50 states in America. Each state and city is annotated with how many courses are available. The search feature of the US Golf Courses app will letting you quickly comb through the database and find a specific golf course you're looking for. 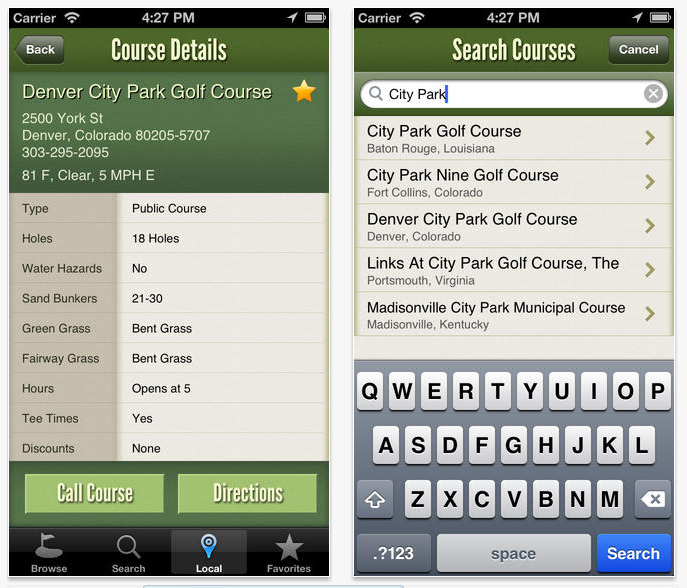 You can mark any golf course in the app as a "favorite" and have your very own list of the places you play the most. With this feature, you can be booking a tee time at your golf course of choice in seconds without having to memorize their phone number of clutter up your phone's address book.